Turkey time is upon us yet again. And it's pretty much the same every year: Maybe you figure out how to talk to your extended family, maybe you silently watch football, but you definitely slice up a dead bird and consume it until you're physically uncomfortable. That's what tradition's all about. But why do we do it now? Isn't any given day the perfect day to give thanks? To answer that, we'll have to travel back to a time before Whole Foods, when people tilled the land and wore funny hats. To start way, way back: In 1621, the Pilgrims celebrated a successful harvest with a three-day gathering, along with some members of the Wampanoag tribe. This wasn't quite the cross-cultural utopia you were taught it was in preschool, nor was it the first Thanksgiving per se, but it's where we get our image from the holiday. That day they were celebrating the harvest, which, as you know, takes place in fall -- hence we celebrate Thanksgiving in fall. Next we jump to 1789. The first Federal Congress asked President George Washington to declare a national day of Thanksgiving, so proclaimed Thursday, November 26, 1789 a "Day of Publick Thanksgivin" (an objectively better name), according to the National Archives. Congress made its request in late September, so November was a natural month to pick. After that, Thanksgiving Proclamations were made yearly and varied by month and date. Finally, in 1863, President Abraham Lincoln proclaimed that Thanksgiving was to be celebrated on the last Thursday of November every year. All was well and good for formalized national expressions of gratitude. In 1939, however, things got weird: Two Thanksgivings were observed. The last Thursday in November of that year also happened to be the last day of the month, and President Franklin D. Roosevelt was worried that an economy still recovering from the Great Depression would be further stifled by a shortened Christmas shopping season. He proclaimed that Thanksgiving was to be on the second-to-last Thursday of November. This was perceived as commercializing the holiday, and 16 states decided they would keep Thanksgiving just where it was, thank you very much. Thirty-two states went along with the president, resulting in a two-year double helping of appreciation, with a portion of the nation celebrating with the president, and the rest of the country celebrating its own Thanksgiving a week later. Obviously, this was silly and unsustainable. Congress thought as much and decided it had to settle on a permanent date. Originally, it settled on the last Thursday, but the Senate amended the resolution and declared it to be the fourth Thursday to prevent confusion on years when November has five Thursdays. The house accepted these terms. In December 26, 1941, Roosevelt signed the resolution, and we got our current holiday schedule. 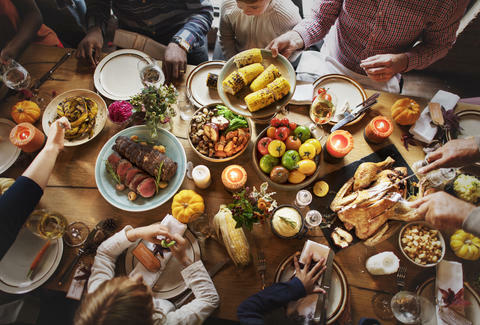 Put simply: Thanksgiving takes place during the fall to celebrate the harvest; on a Thursday in November to follow a precedent set by President Washington; and on November's fourth Thursday to simplify things on years with longer Novembers. And we all lived thankfully ever after. James Chrisman is a News Writer at Thrillist who often makes proclamations, but no one heeds them. Send news tips to news@thrillist.com and follow him on Twitter @james_chrisman2.